Veneers are cosmetic restorative treatment for anterior teeth. They are precisely made to fit over the visible surface of front teeth, like a false fingernail fits over a nail. 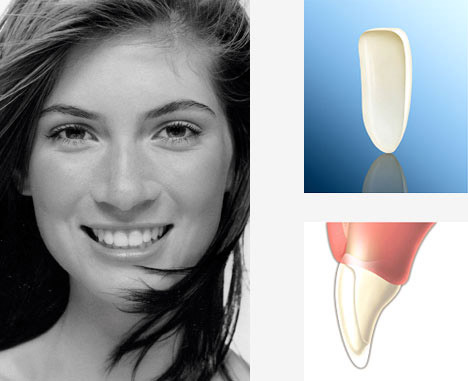 They require minimal tooth reduction so they preserve the tooth structure. They are made of porcelain or composite. Veneers are indicated in cases where esthetics of anterior teeth are involved. Veneers solve problems of extremely discolored anterior teeth, fractured incisors, large spacing between teeth, etc. If you have a problem in the shape, size or color of your teeth, ask your dentist if veneers are the ideal treatment for you.